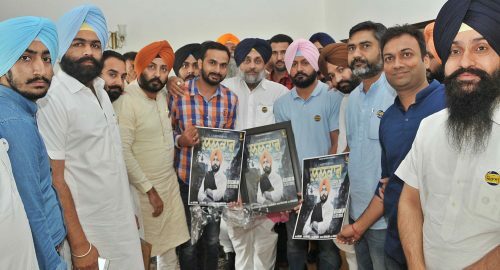 Chandigarh, July 12 : Putting Aam Admi Party on mat in its own style, Student Organisation of India (SOI) today launches an audio-video track ‘Lalkar’ in a befitting reply to sung by one of the AAP leaders. Party President Mr. Sukhbir Singh Badal today releaseç this track sung by Mr. Meetpal Singh Dugri, SOI president of Malwa zone-3 in the presence of Mr. Parmbans Singh Bunty Romana, state coordinator of SOI and several other SOI leaders. Lyricist Mr. Satta Gill in his song ‘Lalkar’ not only challenged AAP’s convener Mr. Arvind Kejriwal for misleading people through false propaganmda but also launched frontal attack on party’s national executive Mr. Kumar Vishwas for describing Punjabis as drug addict in his latest song. Releasing this track here, Shiromani Akali Dal president dared the opposition parties to shed away misleading campaigns targeted to defame Punjab and Punjabis, and have some guts to compete the SAD-BJP alliance on its development agenda. He said that Congress and AAP should atleast try to compare their achievements with the 9 year achievements of SAD-BJP government. It is pertinent to mention here that SOI, the student wing of Shiromani Akali Dal is planning to telecast this audio-video song on all Punjabi channels.